What Is A FOA Certified Instructor? The quality of training at FOA-Approved schools and their students attaining FOA certification depends on the quality of their instructors. To ensure the quality of instructors, FOA has a certification program required of all instructors teaching at FOA-Approved schools. Instructors teaching courses at FOA-approved schools are expected to be technically competent and good teachers as well as having high moral character. FOA has used the knowledge and experiences of many experienced instructors to set standards for instructor certification. The FOA qualifies all instructors wishing to become FOA-certified by reviewing their qualifications and requiring examinations in the subjects they teach and the methods accomplished instructors recommend for teaching the materials. Please note: As part of the process of evaluating an organization for the FOA Approved School program, an instructor candidate is asked to take appropriate exams. Passing these exams does not automatically confer CFOS/I certification. This is one part of the overall Approved School evaluation. The CFOS/I certification is only conferred if the organization achieved Approved School status. Who May Become An FOA Certified Instructor? Instructor certification is only available to those currently teaching at an FOA-Approved school. The school must sponsor the applicant for certification. Instructors must have relevant experience and meet the Instructor KSAs, then pass a certification exam. Another important qualification is that the instructor certification is only valid at the school which sponsors the instructor for certification. If the instructor leaves or the school replaces the instructor, both must notify the FOA about these changes. Instructors who are no longer teaching for their sponsoring FOA approved school must notify the FOA if they intend to teach at another FOA approved school to transfer their certification. The certification becomes valid again after the transfer is approved by the FOA. FOA offers an online self-study Train-the-Trainer (TTT) program for teachers and instructors that leads to the FOA CFOS/I Instructor Certification. This "first in the industry" program brings all the expertise of the Fiber Optic Association to the process of training and certifying fiber optic instructors, both in industry and in the academic world. 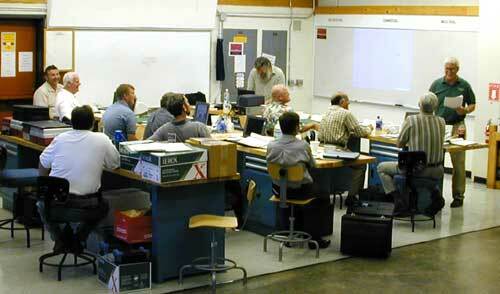 There is no cost for CFOS/I Instructor Certification for a reasonable number of instructors at FOA-approved schools. Applicants who are applying for the first time to become FOA certified instructors and take the instructor exam are granted one year free certification also. After the first year, instructors must renew their FOA certification at regular rates to remain certified. Instructor Certification Testing Is Done Online. Directions are below. Applicants must meet FOA qualifications, be of outstanding character and willing to cooperate within the FOA instructor community. Applicants must be an experienced fiber optic technician or experienced instructor in a technical discipline or both. Applicants to be an instructor must be sponsored by an FOA-Approved school or a school in the process of applying for approval. Applicants must submit the required applications and email a resume covering both fiber optic experience and teaching experience. Two references or letters of recommendation from previous employers or schools where the instructor has taught may be required. Applicants meeting these requirements will be required to take one or more exams on their knowledge and may be required to show evidence of appropriate skills and abilities. FOA will evaluate all these factors before certifying an instructor. Becoming an FOA certified instructor is not as simple as passing a written exam. Depending on the applicant's experience, references and scores on the FOA Certification exams, the applicant may be required to study and retest and/or submit additional information including a classroom video before they are approved to teach at an FOA-Approved school. Instructors who have limited knowledge or hands-on experience in fiber optics may be required to take a CFOT class from a FOA-designated instructor. The exam covers both technical and teaching topics. You should be familiar with the content of our textbooks and the FOA Online Fiber Optic Reference Guide as well as the information we provide on teaching courses for FOA certification. FOA has created a special online directed self-study program for instructors with directions on what to study and questions to prepare you for the exam. Note: The technical material and specific teaching material is very specific to the FOA certification programs. Experience has shown that even highly qualified, experienced instructors who do not use the FOA provided self study guides often do poorly on the exam because they are not familiar with FOA recommendations and practices. Instructors who fail the exam may not take to exam for at least 30 days to allow time to study the materials covered on the exam. Once you have submitted an application and received preliminary approval to take the exam, you will be directed to the online self-study program. First send in an application to the FOA for the instructor. The FOA will review the applicant's qualifications and contact the instructor with directions to prepare for and take the test online. By making this application, I attest that I have read all the requirements for FOA instructor certification and I understand and meet those requirements. I certify that the information I have provided on this application is complete and accurate to the best of my knowledge. I understand that any certification granted by The FOA does not constitute license to practice or provide services when required by any relevant law. I understand The FOA certification does not in any way imply that The FOA assumes responsibility or liability for my actions, and I hereby indemnify The FOA from any liability resulting from my actions. Instructors will receive a provisional certification pending a successful record of instructing. When you have read the requirements for FOA instructor certification and have a sponsoring school, begin the application process by completing the form linked below and sending a resume to the FOA. Use the Instructor Certification application form online. An FOA requirement is that instructors must take an instructor certification exam for each certification that they are teaching, ie: CFOT, CPCT, CFOS/H, CFOS/T, etc. There is no cost for instructors to take certifications exams. You must take this exam online from the FOA. Instructors may submit student applications for taking FOA specialist certifications themselves only 1) after the school has completed first level certification classes 2) submitted student certifications to the FOA and 3) has submitted application(s) for offering those classes. You must take the online instructor exam directly from the FOA. Here is the link to the application to send in the the FOA when you are ready to take the online the exam for the course you plan to give to your students. Instructor Exam Application : Use the Instructor Certification application form online. (C) 2002-16, The Fiber Optic Association, Inc.